Of all the things we need to organize, our time may be the most challenging. I have tried for years to figure out the best way to keep my schedule in order. Actually, it goes beyond just my schedule: It’s the papers that come home from my kids’ school asking for donated supplies. The information about which soccer field they are playing on this Saturday, and which color jersey they are supposed to wear. It’s remembering to get my dog’s nails trimmed every few weeks and remembering people’s birthdays far enough in advance to send a card or buy a gift. It’s setting up a schedule for writing blog posts, and all the other behind-the-scenes tasks associated with that. Lack of Portability: Unless I carried my paper planner with me everywhere I went, I couldn’t check my schedule to plan new events, and I had nothing to prompt me to remember things when I was away from my planner. A few months ago, I decided to give Google Calendar a serious try. I had half-used it for over a year, but I knew that unless I fully committed to keeping everything online and learning more of its features, it would never take. So I watched a few online tutorials, put my paper planners on my bookshelf, and did it. And it has been awesome. The more I use it, the easier it gets, and the more seamlessly it fits into my life. If you work in education, it’s likely that your schedule is big and complicated. 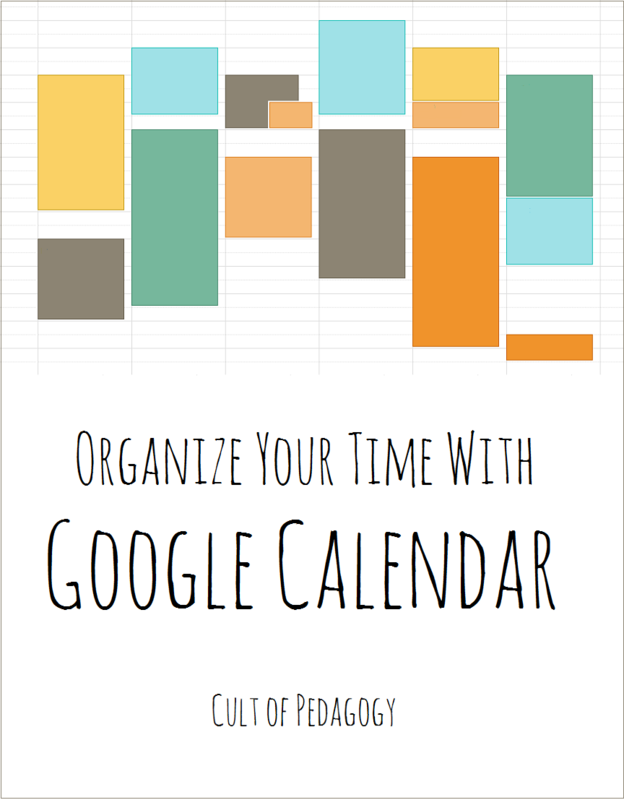 A tool like Google Calendar would be so useful for managing your weekly academic planning, your meetings, your to-do list, and your personal and family calendar. Because it’s cloud-based — it “lives” online and can be accessed from any device — you can keep it updated at school, at home, and even on your phone (available on Android and iOS devices). Next up in my summer organization series, I will be showing you how to organize your projects with Evernote. And check out the one after that, where I show you how to organize your digital files with Google Drive. I love Google calendar. For years I was a paper calendar person, but when I took a job at district office, I was often out and about without my calendar. I switched then and have used it ever since. Is there a way to link up multiple Google email addresses onto the same calendar? Love the info — thanks! I’m a die hard paper planner, but I agree completely about feeling stuck with them at points. thank you for the tutorial. I have floated back and forth from a paper and pencil calendar to an online calendar. This tutorial made me realize that I have to get rid of the paper calendar. This is just too easy! You’re welcome! It definitely takes some commitment to completely switch over — I still have days when I forget to check mine, and I still have hand-written notes stuck on my kitchen cabinets, but I’m getting there. Good luck with it! Got my google calendar downloaded and updated! I use a calendar on my iPad and iPhone and just synced them all together. Now, if I can just keep it updated! I put my class schedule in it (not my plans–just the periods) with a reminder set to go off 7 minutes before the beginning of each class–this translates to a buzzing, flashing phone 5 minutes before the end of each class to remind us to wind up in order to finish on time. A huge difference in my teaching life! What a great idea! Thanks for sharing, Karen! If you do your plans with Google Docs, it’s super easy and convenient to link them in your calendar. Also, very easy to set up Google Hangouts (video chats/conferences) through Google Calendar. Thank you for creating this tutorial! I’m a community hospice nurse and have been trying to find a way to stay organized with multiple schedule changes throughout the week as patient needs change, and paper planning was just not working out. Much like your paper schedule, any changes that I had to make created a mess and it has been very time consuming to adjust on days that I carry a particularly heavy visit schedule. I never realized that Google Calendar had so many features, but this has taught me so much! Thanks again! Hey Torrey! I’m so glad you’ve found it helpful! Video was so helpful. Thank you! I know it’s been awhile since you posted this so not sure you will reply but I have a couple of questions. The first is you mention your reminds will carry over into the following year (birthday segment). How does that work exactly? I would love a calendar that rolls over year-to-year-year…. Next are you able to merge certain calendars and then embed that into your website? For example I use Google Classroom so every time I post an assignment it automatically is added to that class calendar. Multiple class calendars plus a school calendar where I have added all of the school events that I would like to merge into one. The school calendar is the one I have embedded to my class website and would love to be able to merge for parents to easily access. Thanks. Angela Watson has a reference to Trello as a Productivity Tool at the very bottom of her List Making System. I am so glad I noticed this because it is a game-changer. It has a calendar feature if you choose that option. Did I mention it is free? YouTube search it and some great video tutorials will pop up. So simple to use! Thanks for the tutorial, it makes it so easy to use Google Calendar. I never really got into it before but your video made me want to. Cheers!